We welcome your questions and feedback. See our frequently requested phone numbers, our complete phone directory, or fill out our online form for general questions. 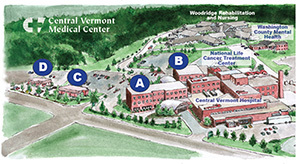 Have a question about Central Vermont Medical Center? (Make or Cancel an Appointment) To contact your provider's office, use the Phone Directory below or login to our Patient Portal. If you do not know the name of your provider’s office, use our Provider Directory to look up your provider's name and telephone number. Billing Questions Contact Patient Financial Services at 802-371-4392 or use our online form. Human Resources Contact Human Resources at 802-371-4191. Give Us Feedback Contact our Patient Advocate at 802-371-4350 or CVMC.Patient.Advocate@cvmc.org or use our online forms to share a concern or share a compliment. *Questions submitted via this form are sent to an administrative department and are checked only during normal business hours. This form is not intended for questions that are medical in nature or to make or cancel appointments. **We will not respond to unsolicited marketing or sales emails. Get Medical Advice Contact your primary care provider (see Provider Directory). If you do not have a primary care provider, please use our use our Provider Directory to find a provider. If you need help finding a primary care provider, call 802-371-5972. MEDICAL EMERGENCIES If you are having a medical emergency, dial 9-1-1 immediately. Click on the service name for more information about that service. If you do not know the name of your provider's office, use our Provider Directory to look up your provider's name and telephone number. This form should not be used to make or cancel appointments, request prescription refills, or ask for medical advice. Please contact your provider's office directly. Is this a patient billing inquiry?